Apple CEO Tim Cook defended the company Tuesday before a Senate subcommittee, saying that Apple uses no “tax gimmicks” in assigning about two-thirds of its worldwide profits to three subsidiaries in Ireland, where the company has negotiated a corporate income tax rate of less than 2 percent. In reality, Apple has paid a far lower rate than the 2 percent negotiated in Ireland, with one subsidiary paying no income taxes in the past five years, and another paying 0.05 percent in Ireland in 2011, according to a report released Monday by the investigations subcommittee of the Senate Homeland Security and Governmental Affairs Committee. 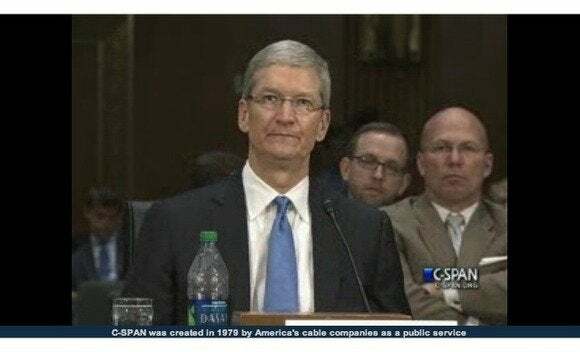 But Cook and two other Apple executives defended their tax decisions before the subcommittee. Apple paid an effective tax rate of 30.5 percent in the U.S. last year and may be the single largest corporate taxpayer in the U.S., Cook said. The company employs 50,000 people in the U.S. and its products support hundreds of thousands of U.S. jobs, he said. Apple set up its first Irish subsidiary in 1980 to sell products overseas and it continues to have significant operations in Ireland, Cook and the other executives said. “Apple has real operations in real places with Apple employees selling real products to real customers,” Cook said. While no one accused Apple of breaking the law, some subcommittee members questioned Apple’s arrangements with its three Irish subsidiaries. Senator John McCain, an Arizona Republican, suggested Apple “invented” new tax dodges. While Apple bills itself as a large taxpayer, it is also “one of the biggest tax avoiders,” McCain said. Apple has an unfair advantage over U.S. companies that have no foreign operations and “don’t have the same ability that you do to locate in Ireland,” McCain added. Two tax experts told the subcommittee that Apple’s decision to assign profits to subsidiaries with no residency for tax purposes was an unusual tax strategy. Apple’s assertion that the Irish subsidiaries are neither Irish nor U.S. for tax purposes gives the company what tax planners fondly call “ocean income,” said Stephen Shay, a tax professor at Harvard Law School and former official with the U.S. Department of the Treasury. When Apple released testimony saying it used no tax gimmicks, “I almost fell out of my chair when I read that,” added Richard Harvey, a tax professor at the Villanova University School of Law School and former official with the Treasury Department and the U.S. Internal Revenue Service. The current U.S. tax system allowing Apple to arbitrarily shift about two-thirds of its profits to the Irish subsidiaries needs to be fixed, added Senator Carl Levin, a Michigan Democrat and subcommittee chairman. Cook also called for tax reform in the U.S. The U.S. tax system is too complex and a high tax rate of 35 percent discourages U.S. companies from bringing foreign earnings back into the country, he said. “The tax system handicaps American corporations, in relation to our foreign competitors, who don’t have such constraints on the free movement of capital,” Cook said. Congress should lower the U.S. corporate tax rate and allow a “reasonable” tax in the single-digit percentages on foreign earnings brought back into the U.S., Cook said. Some subcommittee members defended Apple, saying executives have a responsibility to shareholders to maximize profits and minimize taxes paid. The purpose of the hearing wasn’t to embarrass Apple, but to show the need for tax reform, Levin countered. Cook said he testified voluntarily in an effort to push for tax reform and didn’t feel bullied by senators.